A little while ago my friend Erika Pál had the animation she made for our MA show in Whirligig Cinema’s Making Tracks festival. 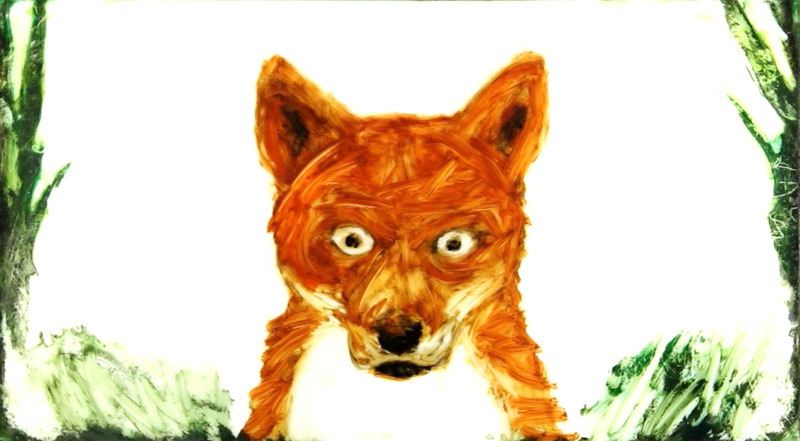 She made recordings of the students describing dreams they’d had, and painstakingly created the animation with oil paints on glass and time-lapse photography. Here she describes how she made it. She doesn’t have it available to view online at the moment, so here are some stills from her website. The idea was that a group of musicians, the Cabinet of Living Cinema, would be given some short stripped of their soundtracks, and they would compose a new one without hearing the original. The new soundtracks would then be played live while the films were projected. The filmakers themselves wouldn’t hear the new soundtracks before the performance, so it would be a surprise for them, and the evening would also be filmed for a dvd. Erika was up first. They had left the narration on her film, as it’s an intrinsic part of it, but they added subtle foley effects. It really worked. My other two favourites were Amar- a film following a day in the life of a schoolboy in India, and one categorising laughter. The music worked beautifully with the films, and the filmakers themselves seemed delighted with the results in the Q&A afterwards. I really want to go to the next one. Erika has been making a new one, and has plans to put all her films up on Vimeo soon.